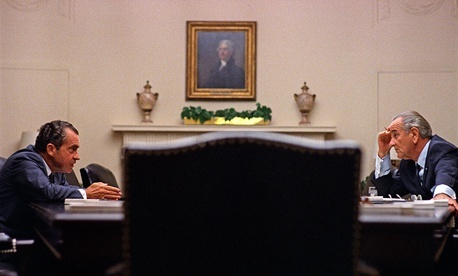 Despite Vice President Hubert Humphrey (with the actor Lawrence Redmond in a fantastic performance) constantly imploring the president to stop the war and get back to work on domestic reform, Johnson doesn’t listen to his better angel. InThe Great Society, Johnson is driven deeper into the war and further away from the liberal forces that were animating the grass roots. His fears of the right cause him to take actions that result in his party’s implosion. Johnson lies so much in the process to survive that he admits not even knowing who he was by the time he announces he won’t run for reelection in March 1968.